The iPad lineup took 27 percent of the tablet market from January to March, according to market research firm IDC. Samsung came in second with 19 percent, while no other single supplier exceeded 5 percent. Overall, the market was down 6 percent year-over-year, the second consecutive quarter in which sales fell. Of those tablets that were sold, cellular models were found to be the most popular, outpacing the market. 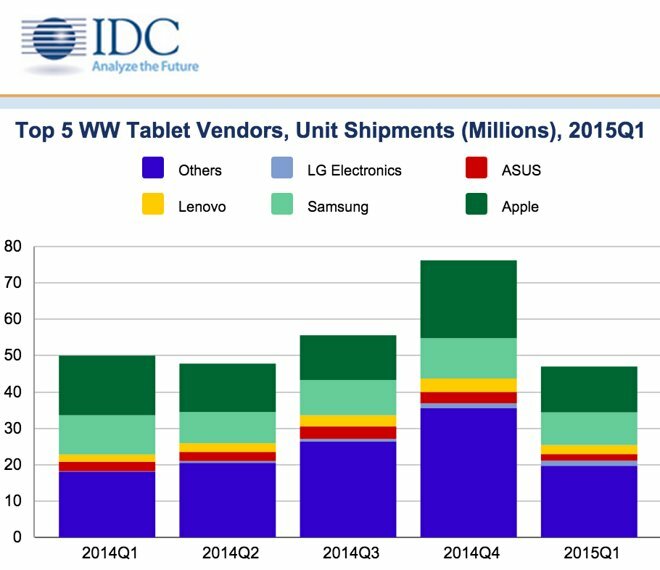 "Cellular-enabled tablets are outgrowing the rest of the market, providing an additional revenue stream for OEMs and mobile operators," IDC tablet research director Jean Philippe Bouchard said in a release. "In addition to driving higher usage than Wi-Fi-only tablets, cellular-enabled tablets also help position the segment as true mobile solutions rather than stay-at-home devices." Convertible devices, like Microsoft's Surface line, also had a strong showing. IDC analyst Jitesh Ubrani noted that "while 2-in-1, or detachables, still account for a small portion of the overall market, growth in this space has been stunning as vendors like Asus, Acer, and E-FUN have been able to offer products at a fantastic value; and vendors like Microsoft have been able to drive growth at the high end with devices like the Surface Pro 3." Apple sold just over 12 million iPads in its second fiscal quarter of 2015, its fifth consecutive quarter of declining iPad shipments. Some of that drop is blamed on the success of the new, larger iPhone 6 lineup, while others believe it represents a natural leveling of the market as tablets— which have longer replacement cycles than smartphones— reach saturation.